My hobby progress has been slow over the last month and whilst I've made progress on a variety of models; Blood Angel Tactical Marines, Slyvaneth Kurnoth Hunters, Tree Revenants and 2 Branchwraiths... I haven't finished any or managed to take any recent WIP photos. 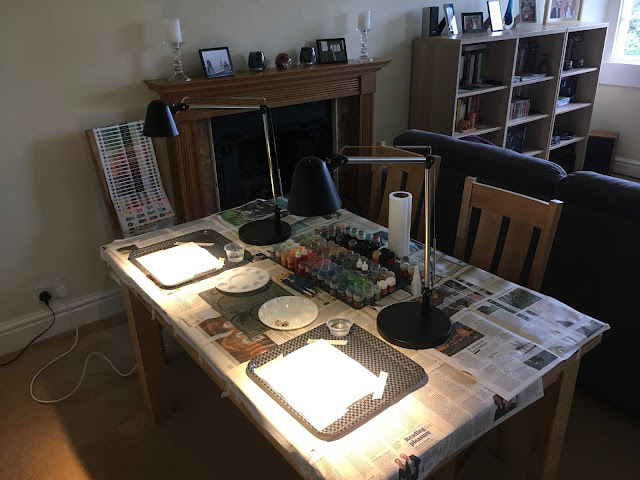 This post, however, is mainly to cover a couple of social painting evenings I've hosted recently in preparation for Nerd Day 2018. 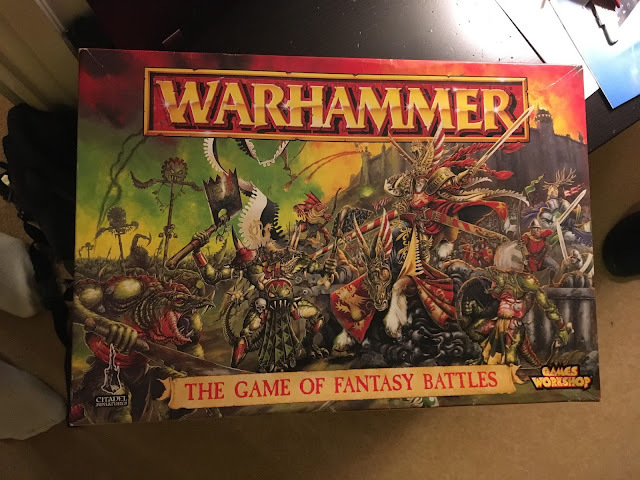 The goal is to help a couple of friends who haven't painted models for many years to paint up a selection of their models which can then be used during nerd weekend 2018. For individuals on the fringe of the hobby I believe the notion of painting models can be quite intimidating... not only do you need to understand the techniques involved, there is also an associated cost (paints, brushes etc.) which can easily become a barrier of entry. Hosting events where I can remove those barriers has been very rewarding and, as you can see below, seems to be nurturing some potential talent! First I'll cover the hobby area! I set up two stations for my budding hobbyists, complete with citadel paint system chart for easy reference. The only requirement I placed on my two protégé was to supply their own models. Neither let the side down! Dan, arrived armed with some goodies from his childhood! 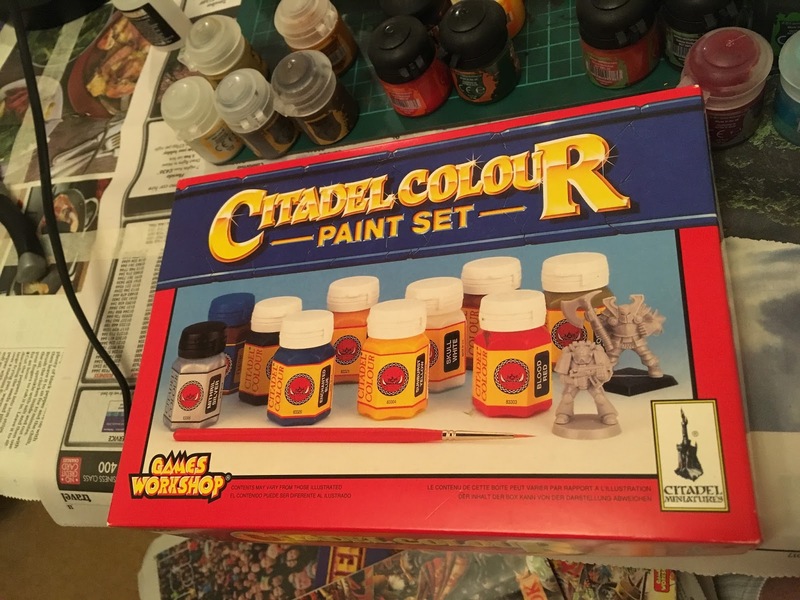 An old skool, 1994, Citadel Paint Set... which had usable paint!! very cool indeed! Dans also brought along a complete Warhammer (4th? edition) boxed set. It's from this set that Dan chose which models to paint. Alongside Dans Fantasy Battle models, Barry rocked up with an extended Skaven 3rd Edition Blood Bowl team! These in progress pictures were taken following the second evening. As you can see, good progress has been made by both hobbyists! Here are the archers Dan has base coated. I've been very impressed by the state of all the models and can't wait to see further progress in the new year.